In building the Engineering Career Coach website, I have had the honor to talk with and assist hundreds of civil engineers in their career development efforts. I also spent 15 years building my own civil engineering career from a land surveyor position in high school to an associate in the same firm at 27 years old. In this post I want to answer some common questions I have received from civil engineers of different experience levels. How many hours do I need to work to be a successful civil engineer? I can’t give you a hard number as an answer to this question because it depends on many different variables. However, make no mistake, being good at anything requires a lot of hard work. And sticking with the question of being a manager within civi l engineering, the reality is that you’re looking at more than 40 hours per week. What’s more challenging as a civil engineering manager may not be the number of hours worked, but making as many of those hours billable as possible while still being able to complete management tasks. When you do design work, you are pretty much always billable. However, as a manager, that won’t be the case. You will have meetings, trainings, and other activities that will be considered unbillable time. Talk to other experienced managers about how they remain as billable as possible. This will be a huge factor in your ability to be successful as a manager and to continue to grow to the partnership level. Should I pick only one discipline as a young civil engineer, or try out different fields? There is no doubt that one of the benefits (and drawbacks) of civil engineering is that there are so many different disciplines. The only negative aspect of this is that it can make it hard to decide which one is right, but overall this gives you a lot of flexibility as a civil engineer. My recommendation is to try as many different fields of civil engineering as possible early on in your career. It is very difficult to determine which field you will like based on your coursework as a student. In four years of undergraduate school and 10 master’s-level civil engineering courses, I never once took a course in land development, but that’s what I ended up doing for most of my career. I had the opportunity right at the start to try structural, geotechnical, and land development. Be open with your employer and tell them you like to be flexible in your first year and try different things; most employers are open to having a versatile young EIT who can fills holes where needed. This approach will allow you to really experience different disciplines and decide for yourself which one you enjoy most. I want to start taking on some management responsibilities at my firm; what should I do? Most civil engineers – not all, but most – aspire to go down the management road at some point in their career. Many civil engineers ask me exactly what they should do to start down that management path. The first thing that I recommend is having a conversation with your supervisor about your management aspirations. Tell him or her that one of your primary goals is to become a civil engineering manager/leader. This is a very important first step because most civil engineers, instead of making their aspirations known, expect their employers to read their minds and move them down that path. Secondly, talk to current successful civil engineering managers/leaders in your firm and in your community. How did they transition into management? What are some key tips they might recommend for you? Lastly, work on your business skills as often as possible. Read books on communication and leadership. Join Toastmasters or a program under the Dale Carnegie Training series. To go from civil engineer to leader requires work, and it’s never too early to start down that path. 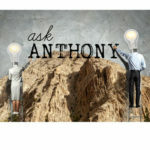 I hope you find this question-and-answer series helpful. 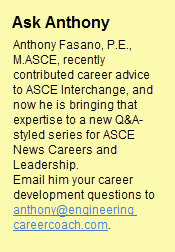 Please feel free to post your questions in the comments section below this post, or email them to me at Anthony@engineeringcareercoach.com. I agree with you that this answer is subjective as are many career and professional development questions, they are different because people, firms and different disciplines of civil engineering are different. But I agree in that each one of us determines our own success, you have to keep moving forward every day! There is no answer to the question posed in the title of this article. It is subjective, and unique to each individual. At the age of 36, I became a partner in a firm. Here is the catch…I did not have an engineering degree. was not a PE or even and EIT at the time. However, I had worked in the field for over 15 years as a technician and supervisor. Apparently, I had the skill set that some one deemed to be adequate for a partnership position. I know this is not what engineers with Masters Degrees, still working 80 hours a week want to hear. I understand. I did eventually get my engineering degree. I do not think it would have made much difference in the final outcome of my career, but it has certainly enhanced it (regulation wise that is). Each individual has the ability to determine the outcome of their future. If you are relying on others to determine the outcome of your future, then you will always be taken advantage of. Don’t be afraid to take bold steps, and never accept the status quo !